Last week I was meeting my mom at the airport, and I was sitting in this nice little waiting area just outside security. I was a tad early, but I’d forgotten my readers, so since I couldn’t check up on my email and Facebook while waiting, I people-watched instead. It didn’t take long to be mesmerized by a dad holding his young baby boy. The child was maybe two months old, dressed in a darling little outfit that only a two-month-old can really pull off. The dad was very sweet, and stood at the front of the waiting space, tender and eager. And then the infant’s beloved showed up – a guy about the same age as the dad, bald in the cool-white-dude sort of way. I don’t think he was the baby’s other dad, because it was clearly the first time the infant and adult had met. I didn’t notice a resemblance between the two men, so I don’t think he was the uncle. The bald dude said hi to the dad and then went straight to the baby. He held him and cradled him and rubbed his twin bald head and was so very, very delighted to meet this new little creature. I could have stood there and watched them all day, the pure joy of the scene. Fortunately – I guess – I noticed that my mom was walking by looking for me, so I left my sweet scene and had my own little reunion. It was not our first meeting, the first time a fifty-something and a seventy-something gazed into each others eyes. A quick hug and kiss on the cheek was our version of the cradling and the rubbing of the head. If airport walls could talk…. If a physical structure can hold the emotions of millions, imagine the feelings ingrained in the drywall. All those goodbyes, some forever. All those trips to go to a bedside, or a funeral, or a wedding, or a birth, or a courtroom, or a commencement. All those reunions of lovers, of families, of old friends, of college roommates, of BFFs. Fear, too, in those walls, and excitement. It’s a wonder rebar and steel beams can bear the weight. The holiday season will add to the airport walls, travelers heading out or coming home or getting away. If I were among them this year (though I am not) I might leave my readers at home so I have nothing to do but watch the people, and get choked up, and be grateful. So I’m working on the discipline of considering my life full rather than considering myself busy. To say that life is full is to acknowledge abundance – an abundance of opportunitities to engage in work that I find meaningful and interesting; an abundance of ways for my child to discover the world with friends and to energize body, heart, and soul; an abundance of riches because we have a home and friends and family and neighbors and community. To say that I am busy puts the focus on just me. I am busy with administrivia and details because no one else can pay attention to them quite the way I can (which is untrue). To say that I am busy makes me feel worthy, because busy people must be important people must be powerful people, right? To say that I am busy implies that every moment is crammed with doing things that must matter a great deal, because why would I cram one more thing into my life if it weren’t deeply important? Yesterday was a full Sunday, though a little less full than usual because we had a guest preacher. There were details to attend to before the service, details that I consider part of hospitality. Worship was full, because the choir was enormous and sang the Beethoven “Hallelujah” from Mt. of Olives, and the preacher made us think about important things, and it took the kids a while to warm up during the chidren’s message, and there were lots and lots of joys and concerns in our prayer time. We sang and we laughed and we listened and none of us was too busy to worship, and our cups ranneth over. As did the service. Oh well. After worship we took the guest preacher to lunch. And then, because his plane wasn’t till evening and because he had no other appointments, he came to our house and we lit the first fire of the season in the fireplace and for two hours we just sat and talked. No phones, no agendas, no excuse of busyness. Just conversation, and that was full too. There was a sense of the blessings of space, of room, of hours that were not filled to the brim with stuff. Yes, the house did not get clean and yes, we had cheese and crackers for dinner. Sometimes when someone asks how I am doing I will say, “Not so good. Life is full.” Because sometimes life is full of the hard and sad things: another cancer diagnosis, or a divorce; disappointment, grief, fear. Sometimes life is full of the stuff that makes being human difficult and I find myself wanting to declutter a closet or two to give the illusion of spaciousness in the midst of that difficult fullness. But later, when the crisis has past, when I’ve gained perspective, I am grateful for the fullness. I am grateful that both joy and pain make me feel alive, full of life. May your cups runneth over. I have moved a lot, and by move, I mean pack up all my belongings and take them out of one dwelling and unpack them in another dwelling. I, with or without my family, moved in 1966, 1968, 1972, 1984, 1986, 1987, 1988, 1989, 1991, 1992, 1993, 1997, 1998, 1999, 2001, 2004, 2005, 2008, and 2011. That’s a lot of cardboard and bubblewrap. Each time I have moved as an adult, I have purged before and after the move. I am so happy for those who love garage sales, but I’m not one of you, so the Goodwill and Salvation Army have benefitted well from my peripatetic life. Each time I have moved I have looked forward to the new thing and at the same time mourned all that is left behind. During the crunch time of moving, I’ve have lived in two places at once, said hello while saying goodbye, closed things up and opened new things. Serving as a pastor in a mainline church in the 21st century feels like being in the throes of moving. I am in two worlds at once. I am in the world for which I was trained in seminary, serving a church with the physical plant and administration of yesteryear. I am in my old house, and while it does creak, I know which floorboards creak. It is a comfortable place. And God is calling me – and us – to move. Not only do I feel completely unprepared to be a post-modern pastor of a church in the 21st century, I am living in two places at once. I am still pastoring in 20th century mode, supporting our work done in the 20th century, leading worship in the style of the old way. I am trying to learn about the new ways, too, and find it getting hard to be holding on to the old stuff while making room for the new stuff. A good purge is needed. 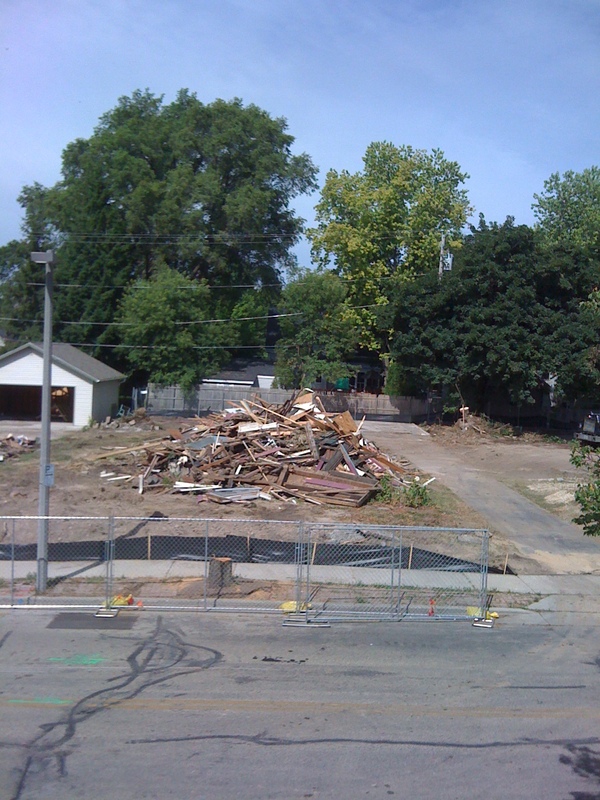 We once lived in a house that was taken by eminent domain and torn down. The evening after the wrecking ball finished its work, I drove by the old place, saw the pile of rubble that had been the home we brought our baby daughter to, and sobbed. Some folks had lined up across the street to watch the destruction, but I couldn’t do it. It felt violent, somehow. Now there’s a brand new fire station there, one that the city needed. Intellectually it all makes sense. Emotionally, it still hurts to look at pictures of the rubble that had been our home. I’m not suggesting we tear the old church down with a wrecking ball. My friend Christine Chakoian wrote a great piece called “Sifting Our Inheritance: What to Keep and What to Let Go” in churchleadership.com. She rightly points out that we do keep some things. But we also let some things go. Do we let go of the organ? If we did that at my congregation, that would getting rid of something that many of our folk consider a prime marker of our identity. Do we get rid of committees? I would love to, and I would love to think creatively about how we would get our work done. I don’t think anyone would mind having one less meeting to go to, but there would be anxiety in the in-between time. Do we let go of paid clergy? Shouldn’t all of us pastor types be working ourselves out of a job? That’s a terrifying thought. When we made our last move, my husband, daughter and I loaded up our Honda Civic and spend four nights and five days driving from Wisconsin to Oregon. It was a great transition time. It was just the three of us and the clothes we needed for the trip and the things they wouldn’t take on the moving van. We promised our daughter we would stay in motels that had pools so that she could go swimming every day. We visited the Badlands and Mt. Rushmore. We marveled at the open skies of the west. We listened to the Wicked soundtrack, over and over and over again. We were cocooned and in each other’s company with no distractions. We needed that, after the hubbub of packing up and saying goodbye, and before the stress of starting anew and unpacking. Maybe the church needs a cocooned, communal transition time, when we take with us only what we need for a short journey. We could do a little sight seeing, and we could sing, and we could find ways to refresh each day. Because there is a new home that awaits with all its own quirks. There will be boxes to unpack and recycle. There will be grief over what is no longer, and joy at what is. But I really don’t want to move again. ADDENDUM: There are no physical moves or job changes in our near future!